Lincoln Tells a Joke: How Laughter Saved the President (and the Country) by Kathleen Krull and Paul Brewer, illustrated by Stacy Innerst. Grades 2-4. Harcourt Children's Books, April 2010. Review copy provided by publisher. My funny connection (small as it may be) to Abraham Lincoln is that I have lived in all three states that claim credit for him. I currently live in Kentucky and when I drive across the river to Indiana for work, I'm greeted by a sign saying "Welcome to Indiana, Childhood Home of Abraham Lincoln!" Then, when I drive home in the evening, I'm greeted by a sign saying "Welcome to Kentucky, Birthplace of Abraham Lincoln!" And of course I spent a few years in Illinois where Lincoln is, y'know, the man. 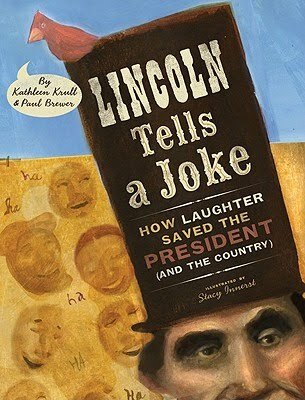 And there are pleeeenty of books about Lincoln, but Lincoln Tells a Joke is a biography with a unique focus: Lincoln's love of humor, jokes, and wit. Most people are aware of Lincoln's love of and belief in the power of words. He's one of the most powerful speakers that America's ever had, but did you know that he was funny? And though some tragic things happened in Lincoln's life (and there was a WAR ON), Lincoln never lost his sense of humor, keeping his friends laughing throughout his presidency. This is a somewhat slight book that'll spice up studies on Lincoln. Despite the subtitle, I'm not convinced that laughter did save the president (or the country), but kids will delight in some of the funny sayings accredited to Lincoln. While it wouldn't be a first purchase and will be more useful for entertainment than reports, it's a good choice for those looking for Abraham Lincoln out of the box. I'm slightly bothered that there are no original sources cited and that there wasn't a more detailed author's note included*. Without original sources, can you really know the quotes are accurate? This would bother me more, though, if it was the type of book likely to be used for school assignments. For entertainment purposes, maybe we can be a little more lenient. Check out more reviews at Muddy Puddle Musings and Review Machine. Lincoln Tells a Joke is on shelves now. And hey, it's Nonfiction Monday! The roundup is over at Bookish Blather, so go take a look at the nonfiction being read by the Kidlitosphere this week!